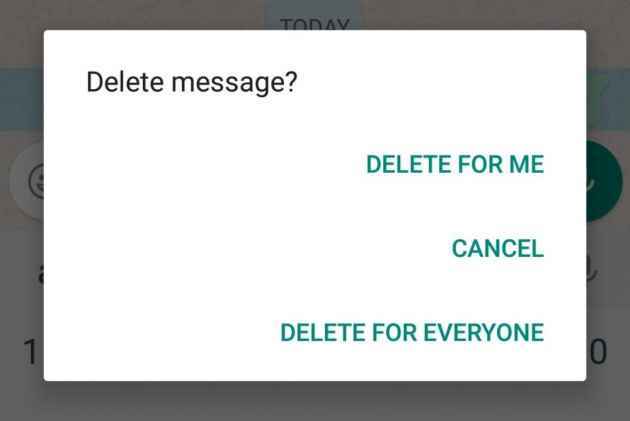 Last year, WhatsApp rolled out 'delete' feature giving relief to many of its users. However, there are certain circumstances in which this feature becomes ineffective and one of them has been recently discovered. If someone has quoted your message on WhatsApp before you delete it, you will still be able to see that message - rendering the 'Delete for Everyone' feature ineffective, a media report said. Users can only delete messages for everyone for up to seven minutes after sending. However, tech website The Next Web reported that quoted messages in chats continued to show in quotes even after they were wiped. It said that this is not a bug and is a part of the feature. If a user sends a message and deletes it from a group or individual chat within seven minutes, the message will disappear. However, if within these seven minutes, that message is quoted then the original message will successfully disappear but the deleted text continues to show in the recipient's quote. Interestingly, there is no mention of how the feature works in cases of quotes in the WhatsApp's FAQ. This comes following the reports in which researchers claimed to discover other shortcomings in WhatsApp's implementation of deleted messages. In one particular flaw - discovered by Spanish tech blog AndroidJefe - it was possible to recover deleted messages from the Android notification history. "Relying on third-party apps, users could browse the notification log to read purged texts," the report said. The Independent later pointed out that this approach could only recover deleted messages that were read or interacted with.